I was just a silly little girl, overflowed with joy as I created my first account. I gave myself a username that I now regret- butterfly7672- but I was so small then. I was fascinated the new world it took me too, a new planet friendlier and more exciting than the one I had come from. My world dissolved into blackness as I was transported to Neopia. Strange people and buildings began to pop up around me. "New?" A Skeith officer was asking me. I nodded shyly. "You better come with me." I followed him passed a place called Neopia Central to an almost deserted path with a wooden sign that said "Welcome, New Neopians!" A few nervous looking users were walking along the path with their own officer by their side. We reached an important- looking building and walked through the revolving door, which smacked me in the face. "Easy there," said the Skeith, steadying me. The building was the most confusing place I had ever been in. Inside the door was... two more doors? The Skeith directed me and an older boy to the door on the left, and two other girls were directed to the door on the right. Inside that door was... two more doors of course. I was directed to the door on the right this time while the boy was told to go to the door on the left. I looked to the Skeith officer who was watching me closely. "Good luck," he said. "Don't worry- you'll be fine," he added when he saw my terrified face. "What's going to happen to me in there?" I asked nervously. "Nothing... much," the Skeith said ominously. "Goodbye." He trudged away, leaving me and the other boy alone. Should I go, or should I not? The boy who was going through the left door looked like he was having the same thoughts. Our eyes met, and on unspoken agreement, we nodded to one another and opened the doors. I held my breath as I plunged into the darkness of the room on the other side. "Welcome to the Creation Room." A cool female voice greeted me as I walked in. I began to panic. Creating what? And where was the voice coming from? "This is where you'll be creating your first Neopet." That was it? After all the fear and worry... And that Skeith was just trying to scare me! I should have known. Relief began to settle in as I began to relax. The voice must've been coming through speakers that I couldn't see, for the room was pitch black. A holographic screen appeared in front of me, glowing blue. Where did this technology come from? I have heard rumors about a Neopian Space Station though. Maybe they did things like this. The image glowed brighter, and it took a few seconds for my eyes to adjust to the light. "Please choose the species of your pet." The voice instructed. I gazed at the different types of pets that were now displayed on the screen. I liked them all, but one stood out to me in particular. How did I choose? Was I supposed to touch the image? I stretched my hand out, but the image just dissolved around my hand. Maybe I was supposed to say it? "Kacheek," I said out loud, pleasantly surprised to hear how calm and confident my voice sounded. A holographic Kacheek appeared on the screen in front of me. "Please choose your pet's color," the voice told me. The holographic image showed what the Kacheek would look like in the four basic colors. "Blue," I replied, getting more comfortable with every word. "Please select a name for your pet." My confidence wavered for a moment. I waited, but no options appeared on the screen. I had to come up with a name myself. "Urgh-" Blue, I told myself. My pet's blue. Let's work with that. "Sky?" "I'm sorry, that name has been taken. Please try again," called the voice. "Remember, you may use letters, numbers and underscores. The name can be anywhere from three to twenty characters long." "What about sky_," I asked, "with an underscore?" That name was taken too. Numbers, I told myself. I'll use numbers. "How about... sky5444?" "The name sky5444 is available." I silently cheered. "Moving on. Male or Female?" "Female," I replied, becoming more and more sure of myself. There was nothing to worry about. The Kacheek on the screen grew eyelashes and turned blue. The name sky5444 appeared underneath it. The voice continued to ask me questions. "Please choose your pet's personality. Where does she like to live? What does she like to do? How does she react to meeting others?" I answered the questions as the voice asked them without hesitation. "Just one question to go. Please take a look at the Battledome Stats in front of you and choose one for your pet." The Kacheek hologram shrunk and moved to the side of the screen. In it's place were three options of stats that didn't make the least bit of sense to me. The voice didn't offer an explanation- I guess they expected you to know. "Umm... option C?" I chose randomly since I didn't even know what the Battledome was. It didn't sound like something for me anyway. "Thank you. Process complete. Your pet will be generated shortly." What did that mean? I had no idea. The screen glowed brighter and brighter until I had to avert my eyes. Then it vanished, simply dissolving, and a blue Kacheek stood in its place. Except, we weren't in the creation room anymore. We were in a lush and beautiful field where apparently Autumn came early, because the leaves were already turning red. In May. The Kacheek appeared to be trying to catch the falling leaves. She didn't notice me, and I didn't want to disturb her. I hid behind an old oak tree, watching as she scrambled about with delight on her face. I was about to leave the cover of the tree and introduce myself when a twig snapped as my foot made contact. The Kacheek gasped and turned around, eyes widening as she saw me. "What... what are you?" She was the first to speak, breaking the uncomfortable silence that we had shared for a few minutes. I gave her a dry smile. "I don't suppose you've ever heard of me. I'm human. From another planet." Her eyes grew wider with recognition. "Like those people I see with other pets walking around! I always hide when they come. I don't want them to find me. I like it here, where it's always my favorite season." "How long have you been here?" I asked, as fascinated by her as she was by me. "I- I think I just came here today. Before that..." She looked confused. "I can't remember. They told me to wait here. Said someone special would come for me." "Who told you this?" I asked gently. "I... don't remember." Her face scrunched up with pain as she desperately tried to recall events that had happened only today. "Sky5444," she replied without hesitation. Then she looked confused again. "At least... I think so. I'm not sure how I know. I just do." "It's okay. I understand." Sky5444! Wasn't that the pet I just created? I was as confused as her, but I hoped it didn't show. "Where do you live? Do you have an owner?" Her face darkened when I said this. "No," she replied hoarsely, "I don't have an owner. As for where I live, well I've been here for as long as I can remember, as weird as that sounds. It's like I just... appeared here. I'm not sure when. Sometime today though. It could have been a few minutes or a few hours ago." "Hey, Sky?" She looked at me glumly. "Cheer up, there's no need to be like that." "Yes, there is," she replied miserably. "I have no home, no family, no friends." "Well, consider me your friend. You're not alone." Her face brightened a bit. "Do you really mean that?" "I mean much more than that." She gave me that confused look again. "What do you mean?" "Sky." I looked at her seriously. "I'm new to this planet. I'm not used to the people here. But I want someone with me. Sky, would you like to go home?" "Go... home?" She asked me, hopefulness in her eyes. You mean..."
"Yeah. I do." She smiled as wide as she could and hugged me. I hugged her right back. 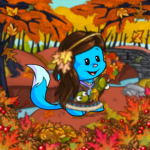 I have my first Neopet now, and it was going just fine. As we began to walk away, I was about to point out that I had no idea how to get out of this place, but the world around us began to dissolve until we were outside that important- looking building. But this time, I had someone with me. On our way to Neopia Central, I spotted the boy I say earlier, walking side- by- side with a green Zafara. He saw me watching and winked at me. I gave him a thumbs up and a smile in response. We finally reached Neopia Central, passing the Skeith Officer that guided me as we did so. He saluted me as I walked by. Sky and I got to know each other pretty well. She told me about herself and about Neopia while I told her about me. I'm glad that I had Sky to help me out though. I would've been lost without her. After finding our way to the real- estate agency, (after about an hour of wandering) we realized that we would have to get ourselves a Neohome. We spent about half an hour just deciding where to get it. "Oooh, how about Mystery Island?" Sky said as we took a look at the catalogs. "Hmm... too hot. What do you think of Terror Mountain?" "No way! We'd boil. The Haunted Woods?" Sky shuddered. "Not there. Anywhere but there." We leafed through the pages for a few more minutes until I saw a place that made me gasp. Delighted, I showed Sky the brochure I had in my hands. Her eyes brightened. "That's it! That's it! We're moving there," she said happily. "Oh, thank you!" I smiled at my new friend. "So it's settled then. Let's get to Faerieland." More than six years have passed now, and Sky and I are still living happily in our Faerieland with her three other sisters. Six years. Yet I remember it like it was yesterday. How important is winning when it's not the right thing to do?